The Skillet Glacier on Mt. 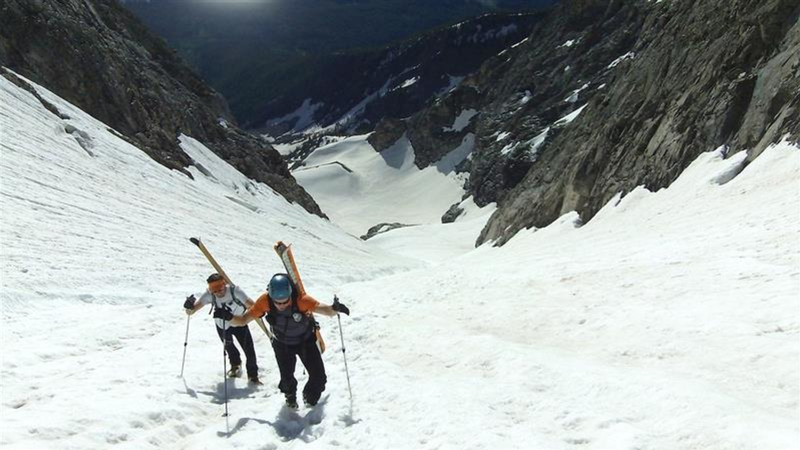 Moran is a classic skiing destination in the spring as well as a really great place to snow climb during the summer. 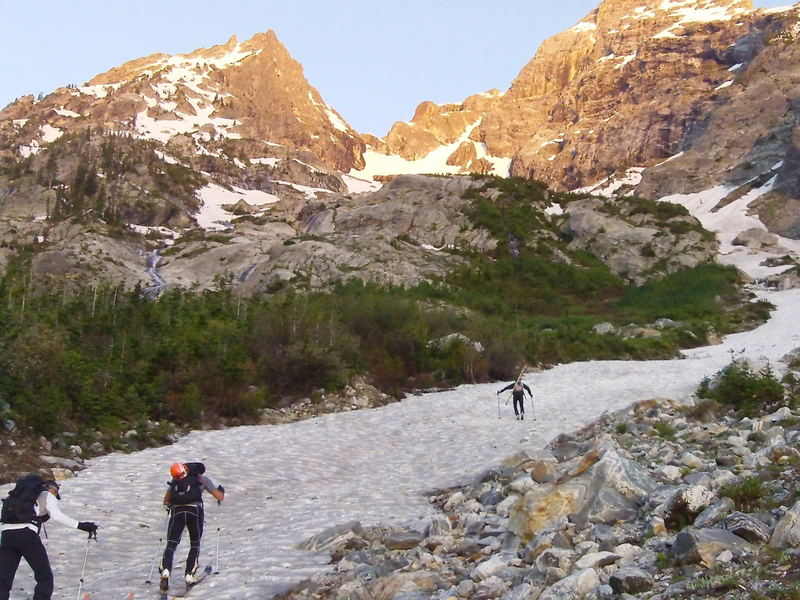 It’s one of the classic ski descents in the Tetons, but, for non-skiers, the Skillet Glacier on Mt. Moran is a pretty awesome snow climb too. BUT, we’re not going to recommend it for beginners. 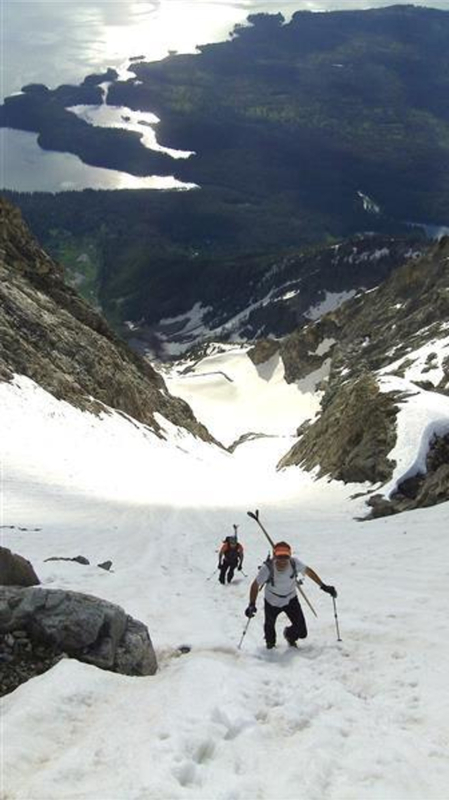 Due to a large crevasse that opens at the lower end of the handle, a slip or fall up high could be disastrous for skiers or snow climbers unfamiliar with self-arrest. That written, if you’ve got the skills, the Skillet is one of our favorite snow adventures in the park, especially if you’ve got a friend with a motor boat willing to take you across Jackson Lake and then fetch you again the next afternoon. One of our favorite stories is of a party of local skiers that skied the route over the Fourth of July and had a motorboat pick them up. They then took turns waterskiing back across the lake (not on their snow skis; the boat had water skis for them to use). 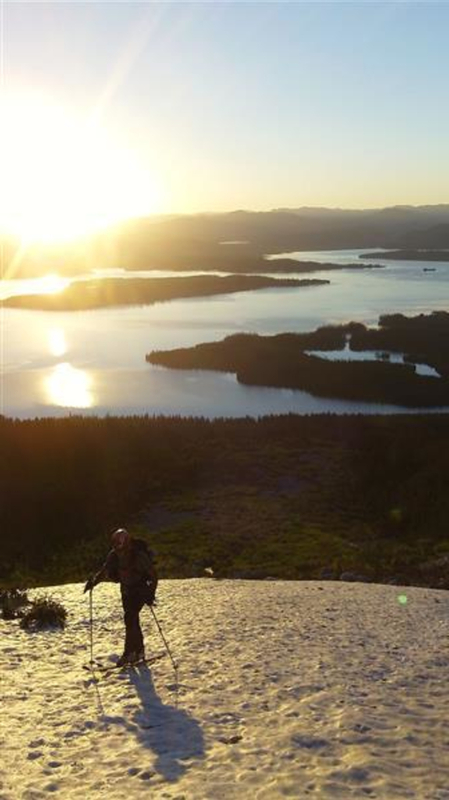 If you don’t have a boat and/or friends you can call upon, you’ll be bushwhacking from where the maintained Valley Trail ends at Bearpaw Lake, north of String and Leigh lakes. 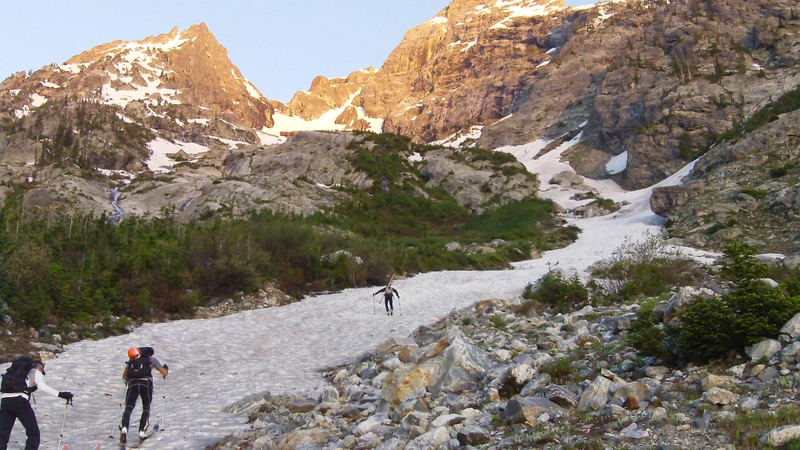 Fair warning: The bushwhack from this point at Skillet Glacier is widely held to be among the worst in the park. 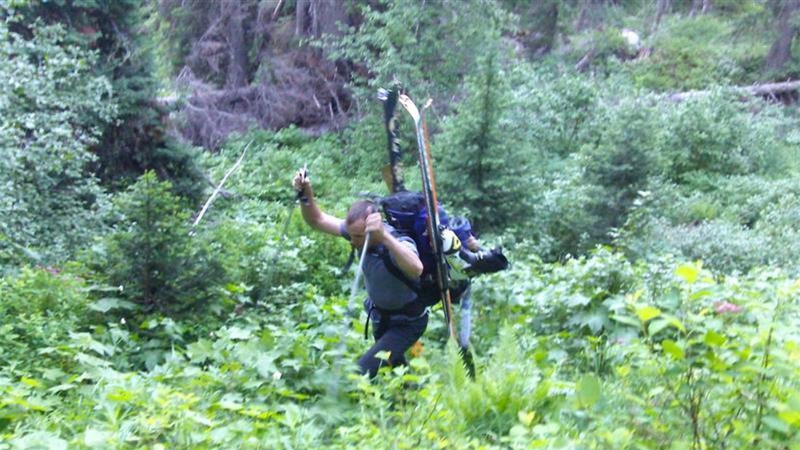 Trees brought down by avalanches are everywhere. Thankfully, it’s not super long. If possible, your best bet is to walk up the creek itself, hopping from boulder to boulder. The main streambed can be followed almost all the way to morainal basin at the bottom of the glacier. Once you’re on the glacier, the route is fairly straightforward: up. Head for the bergschrund separating the pan from the skillet. Below it, head for the rock island to the south. Scramble up these slabs until you can get back onto the glacier and then head straight for the handle, by far the steepest section of the climb. 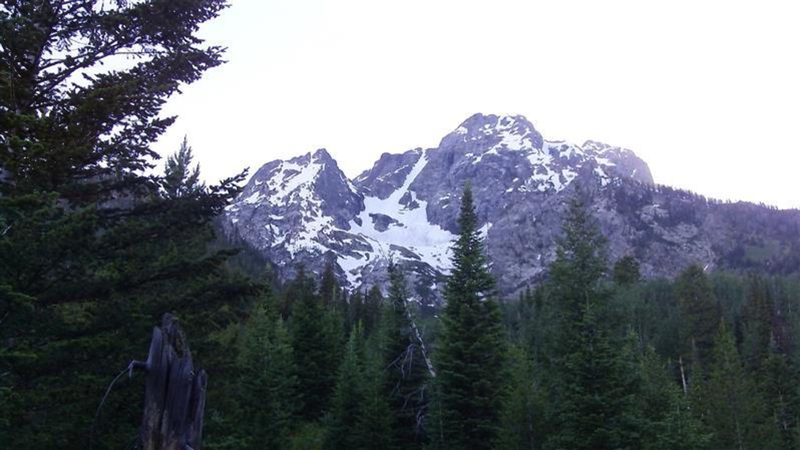 The south fork of the handle usually has a sliver of snow that runs almost all the way to the summit. The final bit is easy scrambling. 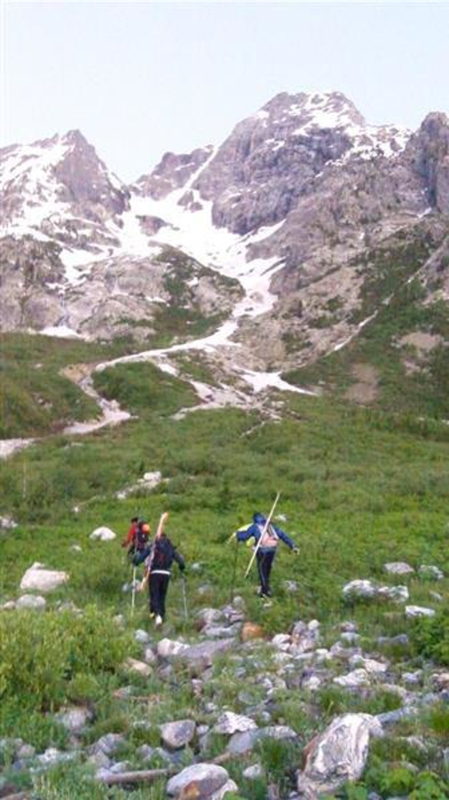 If you’re climbing and do decide to glissade on the way down, please, please, please be careful. That crevasse at the bottom can eat people up! 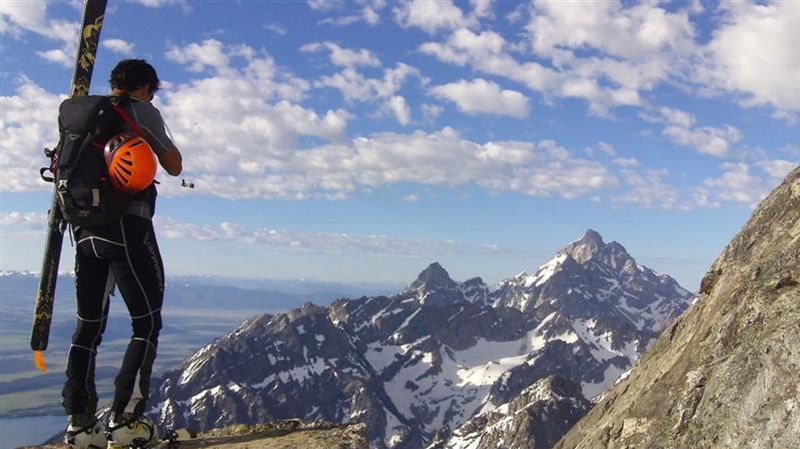 It’s a classic ski descents in the Tetons, and it's a pretty awesome snow climb too. From where the Valley Trail ends, you want to head north past Trapper Lake and around the east side of Moran. There’s an obvious creek coming out of the Skillet Glacier.